Capt. 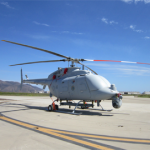 Jeff Dodge, manager of the U.S. Navy‘s Fire Scout program, has said the Northrop Grumman-built MQ-8C unmanned helicopter is scheduled to reach initial operational capability status by the end of the year. Dodge added the development of MQ-8C, which is slated to undergo initial operational test and evaluation this month, builds on the MQ-8B deployment history, the Navy reported Tuesday. The service branch also seeks to demonstrate the new helicopter’s capacity to integrate with the Link 16 data network and deliver target data to airborne weapons in real time. Capt. Dan Mackin, manager of the Navy’s Triton program, said the branch will deploy its unmanned MQ-4C unmanned aircraft system to Guam later this year as part of an early operational capability effort. MQ-4C, also built by Northrop, will continuously operate from five orbits to support intelligence, surveillance and reconnaissance missions. The Navy has conducted Triton operational test flights at Naval Air Station in Patuxent River, Maryland, over the past two months and said it plans to transfer test activities to NAS Point Mogu in California soon.